Customizing your Center Console Your custom Sprinter van’s center console is not only a visually stunning part of the Bespoke experience, but if you’ve ever tried and failed to find a place to put your hot coffee or ice-cold soda, you know cup holders can have a significant impact on your traveling experience. 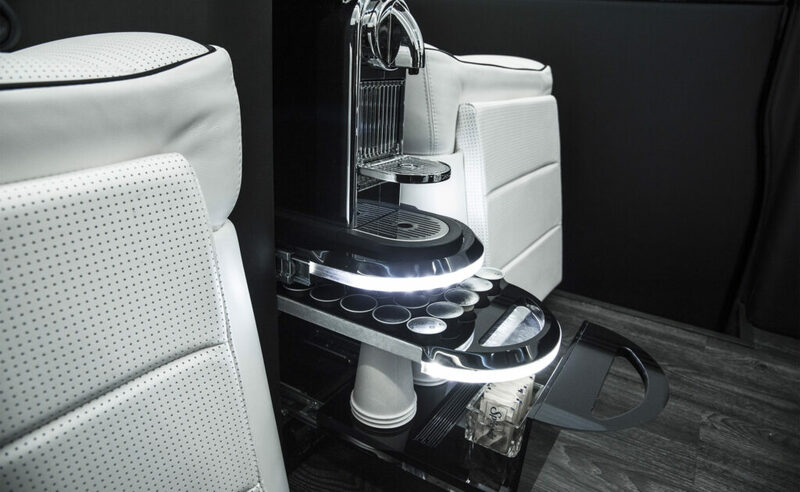 With that in mind, you’ll be pleased to know that the basic center console of your custom Mercedes Sprinter from Bespoke Coach comes with two cup holders, and can be upgraded with a range of features to meet your requirements. At Bespoke Coach, we give you plenty of options to customize the center console of your custom Mercedes Sprinter van in accordance with your specific needs, whether you’re eager to entertain or just want to get down to business in your luxury mobile office. 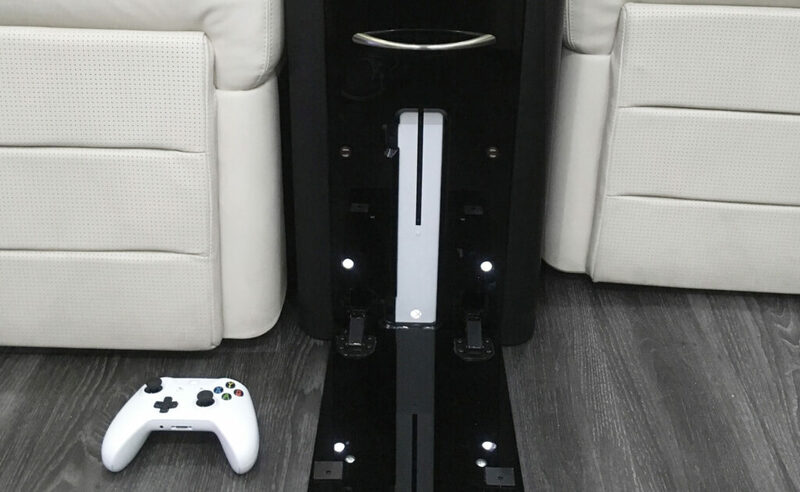 Below are the regular options; however we can build whatever you want, whether it’s installing a computer or adding an XBox. If you choose the 144 Executive Coach as your custom Mercedes Sprinter van, you have the option of adding four storage drawers to the front center console or a Nespresso espresso-maker complete with 40-flavor capsule tray. You can also add either a trash bin or a digitally controlled, portable refrigerator/freezer from Dometic that holds 24 quarts to the front center console. The storage drawer upgrade is also available for the rear center console, or you could elect to go with two motorized laptop tables and a digitally controlled, portable refrigerator/freezer from Dometic that holds 24 quarts. For Bespoke Coach customers drawn to our Sprinter van conversion that features a 170 wheelbase and high roof – as opposed to the 144 wheelbase and standard roof detailed above – we’ve got you covered in the center console department as well. As with the 144, the front center console for the 170 can be upgraded to include four storage drawers, a trash bin, a built-in espresso machine, or a 24-quart Dometic refrigerator/freezer. To get started customizing your center console and all the other elements that come with a one-of-a-kind custom Sprinter van, contact Bespoke Coach at 1-800-470-8888 or info@bespokecoach.com.